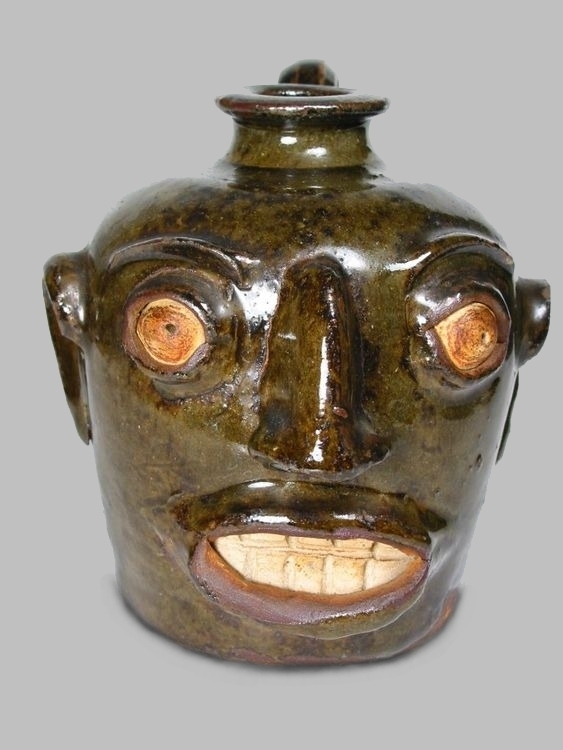 As long as man has worked with clay making vessels, imagery of the human face has been modeled. 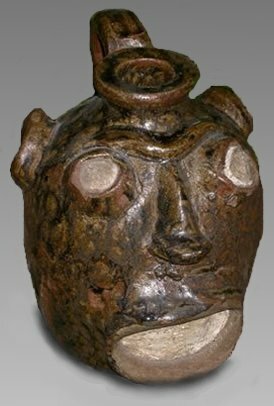 In North America the earliest known face vessels or jugs were made by the Native American mound builders of the Middle Mississippi region. There have been a number of these found in grave sites and were associated with burial rituals. When studying these ancient pots, it is clear that the images were of the dead. The closed eyes and open lips of all known pots convey this. Some have been found with the charred remnants of human bone fragments inside. The vessels are decorated with multiple incised line work. They also share a strange grappling hook-like icon incised near the corner of the eye. 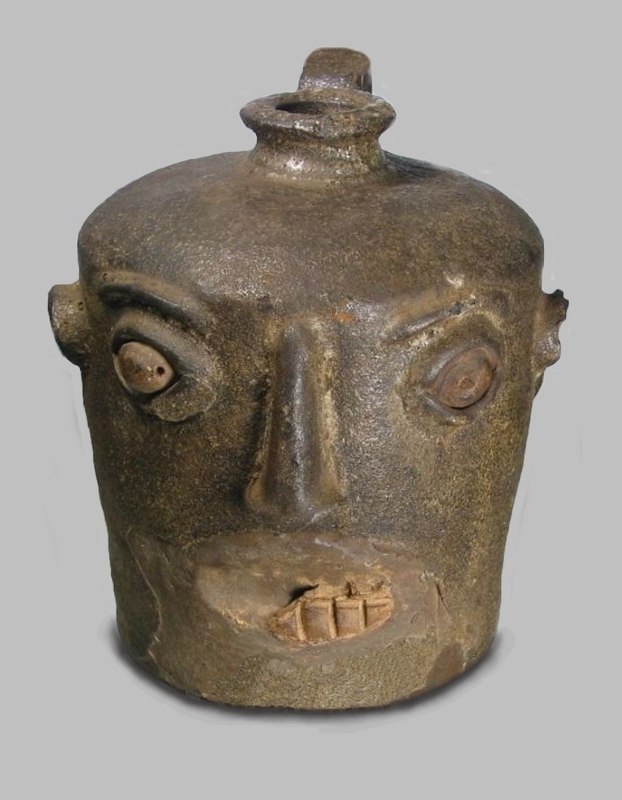 Undoubtedly, these were the first face jugs on this continent. I think I’ve heard potters from at least 20 states claiming the face jug first appeared in their state. I live and make pots in what was called the Old Edgefield District of South Carolina. What is known as fact is that face jugs were made at the Col. Thomas Davies Factory near Bath, SC, at the Miles Mill stoneware factory and the B.F. Landrum Factory at Sunnybrooke near Vaucluse, SC in present day Aiken County. Most of these early Edgefield District stoneware factories used slaves in the production of wares. Some of the last slaves to enter the United States came on the ship Wanderer to Savannah, GA in 1858. 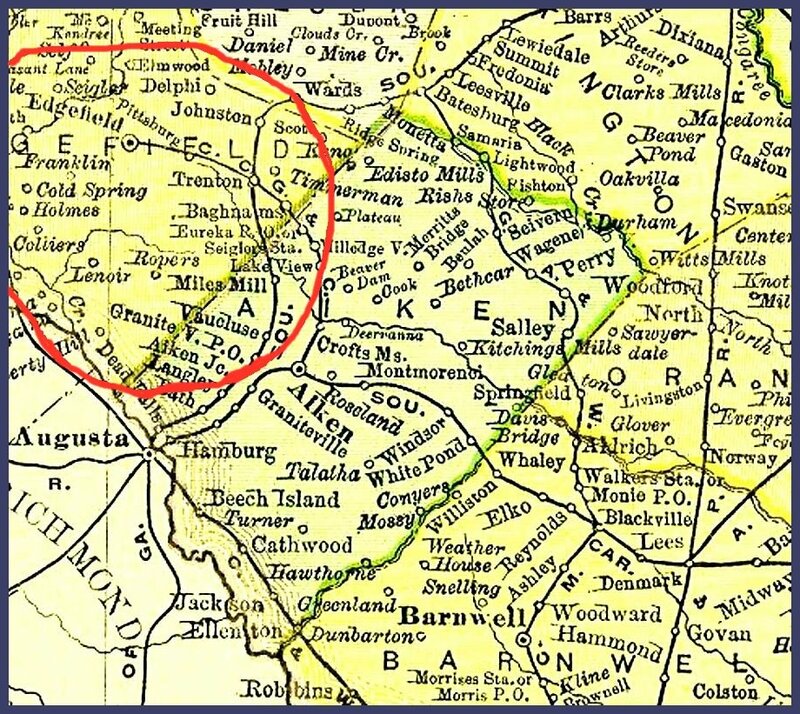 The importation of slaves had been illegal since 1808, but the institution of slavery was still legal.These slaves were then sent up to the South Carolina side of the Savannah River, one half mile below the mouth of Horse Creek, to the planters around Augusta, GA, Aiken and Edgefield. 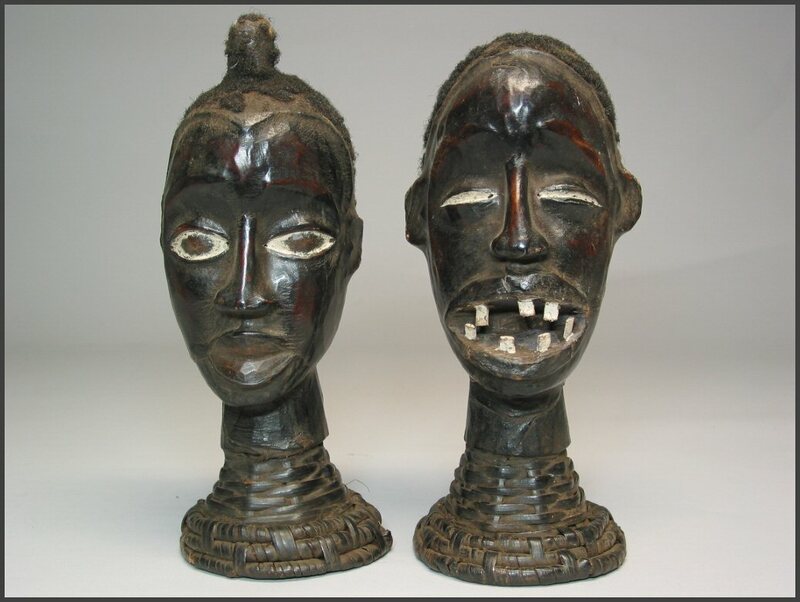 These slaves were from the Congo River area in West Africa and most likely played an important role in the evolution of the face jug. It is believed that the slaves at some of the SC stoneware factories were allowed to make objects of their choosing during time when they were not working. Edwin Atlee Barber in his 1898 volume on Porcelain and Ceramics in America actually interviewed Col. Thomas J. Davies, owner of Palmetto Firebrick Works. Davies describes some of the slaves making these face vessels. Davies business ledgers show he owned 23 of the Wanderer slaves. I do believe the slaves were the makers and originators of these early crude face jugs. These early pieces had emphasis on the white kaolin eyes and teeth. The glaze was wiped off of them before firing. Ceramic historians debate whether the slaves were duplicating in clay symbolic icons of their African culture or whether they may have seen the popular Toby-mugs of that period which were made at Bennington Vermont. Affluent plantation masters were probably in possession of these Toby mugs since they were the latest rage. Also, and most importantly, the owners of the United States Pottery Company in Bennington, VT folded and moved to South Carolina to start a new porcelain works in 1856. 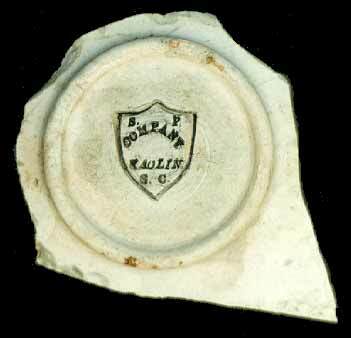 This concern was called the Southern Porcelain Manufacturing Company and was located in Kaolin, SC (near Bath, SC) next door to Col. Thomas Davies pottery. 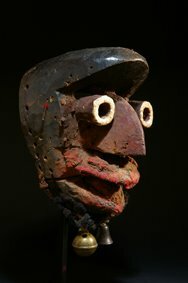 There are publications where eye-witness accounts are given of English Toby figures which were incorporated into graves in the West African Congo Region in the 19th C. The Toby figure in England came to popularity in the 1760’s as Staffordshire potters started producing these figures in 18th Century dress, i.e., tri-corn hats as mugs, jugs and pitchers. At about the same time Southern Porcelain was in operation (late1850’s), Col. Thomas Davies set up his factory (1862), the Palmetto Fire Brick Company next door making refractory fire brick and, later, ceramic items for use in Confederate hospitals. Slaves working for him may have been exposed to the Toby or face-style mugs and pitchers. 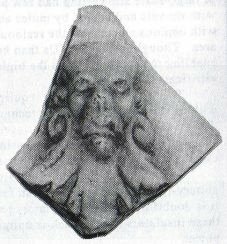 I’ve done extensive research at the Southern Porcelain site and have found other spooky-looking satyrs on the porcelain molded pieces which were made there and could also have influenced slaves (see photo of shard) The slaves who worked in these potteries at various tasks, were considered more valuable than average slaves and were often “rented” out to neighboring potteries to settle debts or to generate additional income for their master. Numerous records in existence show this to be fact. The Edgefield area and present day Aiken County had around 25 or so of these early stoneware factories operating from 1810 until about 1930. They produced millions of gallons of utilitarian items such as jugs, churns, jars, etc. This area was a proving ground. Many potters, black and white, learned their skills here and later migrated on to all of the southern states and as far west as Texas and even to Ohio. Most likely they carried the notion of the face jug with them. The most famous of these potters was the enslaved African potter known as “Dave the Slave” or Dave Drake. Several fragments of face jugs were found at the long lost site called Stoney Bluff in Aiken County where Dave worked for many years. It is not known whether he might have made any face jugs. Ceramic historians seem to agree that the crude face jug, as we now know it, most likely came from these early SC factories. Face jugs/pitchers/mugs have been made prior to the Edgefield face jugs. Even in ancient Egypt. Most of them are highly modeled and finished. It appears the Edgefield-style of crude face jugs, which is the subject of this piece, appeared about the same time (late 1850’s) as the slaves from the Wanderer slave ship. The slaves were transported up the Savannah River to the Augusta, GA/ Edgefield, SC area from the Congo River in Western Africa. Some of these Wanderer slaves, i.e. “Romeo”, Ward Lee and Tucker Henderson (pictured here after freedom) lived their lives out around the Miles Mill and the BF Landrum potteries near Eureka and Vaucluse, SC (present Aiken County) where these face jugs were found (from census records). These 3 slaves, as well as the other Wanderer slaves achieved somewhat of a celebrity status throughout the country. The Wanderer’s owner, Charles Lamar, had secretly smuggled these Congo-born African Americans into this country and violated the laws against slave importation which had been in effect for many years, making them some of the last captured humans pressed into slavery in the USA. They were the only group of slaves known collectively by the name of their ship of arrival. This triggered a congressional investigation and proceeding trial of the owner and captain of the ship. The trial, held in South Carolina, ended with a slap on the wrist for Lamar and was a mockery of justice carried forth by those who’s interests were served by perpetuation of slavery. Lamar was allowed to serve his brief “time” in his luxury apartment in Savannah under house arrest. The other pottery where face jugs were found was at the Col. Thomas Davies’ Palmetto Firebrick Factory near Kaolin, SC. Some 137 of the Wanderer slaves disembarked from the steamboat Augusta at a wood yard near the Davies Factory on the SC side of the Savannah River. Charles Lamar, who owned the slave ship Wanderer, owned lands around Davies’ pottery and also had interests in the Southern Porcelain Company at Kaolin, SC. Interestingly, Lamar was one of the last casualties of the war as he foolishly made a target of himself in a feigned cavalry charge in Columbus, GA. 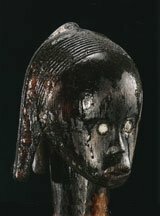 Almost every decision and event, from crop planting to war, in the West African cultures involved the consultation of ancestoral spirits through these carved faces and masks in ceremonies and rituals. Fragments of ancestoral skulls, teeth and bone were stored in lidded bark baskets. The carved wooden heads and statues, called “byeri”, were mounted on top of these sacred bone holding baskets. It is easy to see that the Wanderer slaves who settled in and worked the potteries of the Edgefield area along Horse Creek would have been devastated without the single most important cultural item which they had to leave behind in Africa. Without concrete evidence, we can only visually compare these two different mediums for similarities, while realizing this crude style of face jug was not made prior to the Wanderer slaves arrival. Face jugs did spread across many parts of the USA after the 1860’s, as potters migrated from the proving grounds of the Edgefield potteries. Take time to look at these byeri. 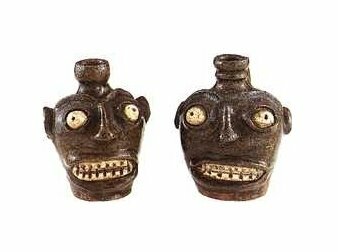 The location and placement of facial features is remarkably similar to the Edgefield face jugs now in collections. It was also common in this region of West Africa to make ceramic effigies with human traits. Only certain tribal members could “blow” life into these vessels, giving them powers. These 3 photos are carved-wood byeri from the Congo area, Central West Africa, circa 18oo’s. Following are several face jugs which are attributed to the BF Landrum, Miles Mill and Col. Thomas Davies pottery and are suspected to be slave-made.